I also have a motor that is an 1988 Evinrude 6 hp long shaft and the asking price for it is $500. I had put about 80 miles on it before it was stored. I can either sell the motor with the boat or not sell it. The boat and equipment are located in Lake Jackson, Texas. 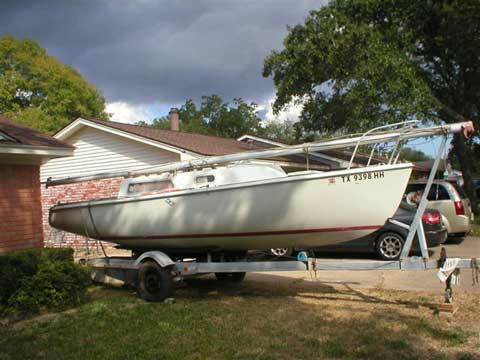 This boat was purchased in 1978 and was one of the last Gulf Coast 23's built. It has a swing keel and draws 5 feet when down. The hull is in good shape with a few scratches and needs some small repairs on the deck. Otherwise, very few cracks. There are 5 sails which include a jiffy reefing main (sail area 188'), jibs are 180, 150, reefing 130 to working jib size, and a spinnaker. Sails were purchased with the new boat and are in quite usable condition. They were not stored on the boat unless in use. Boat was used in salt water from 1978 to 1990 after which time was stored inside and not used since that time. The shaped centerboard which weighs 500 pounds should be removed and cleaned up as the galvanizing is no longer present. The inside of the lockable cabin is clean with cushions on the bunks and has an electrical box. Other items on the boat are 2 anchors with line, porta potti, spinnaker pole, halyard and sheet lines, two Barlow winches, adjustable tracks for sails, marine radio and antenna, and other misc. equipment. The trailer is a galvanized tilt model and has new tires bought within the last 4 years with a spare and new bolt on lights.